Another case of fame in a writer’s lifetime, but absence from the bookshop shelves today, is Erle Stanley Gardner (1889-1970). I loved his books when a schoolboy. 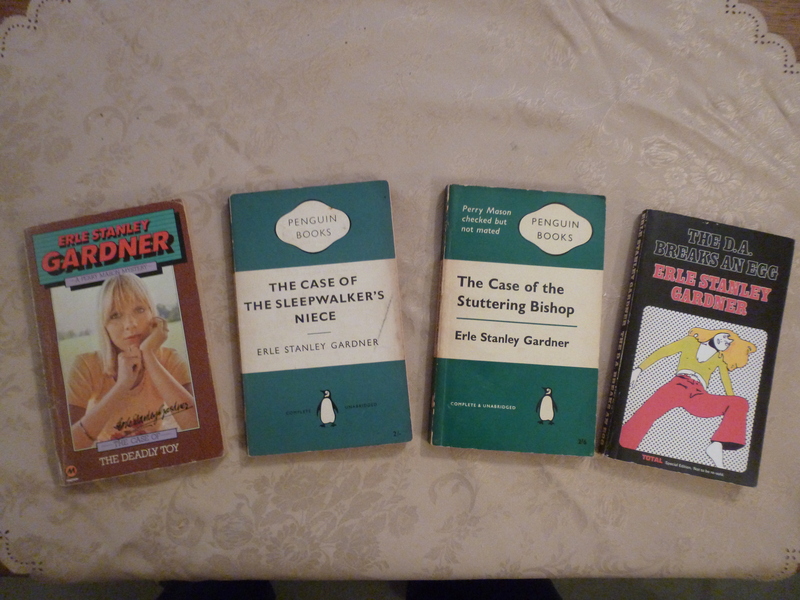 I had quite a collection, now shrunk to the three pictured (following the domestic mishap mentioned in my post about John Creasey at https://ninevoices.wordpress.com/2018/02/19/no-longer-on-the-bookshop-shelves/). I can’t find him in first-run bookshops now – though I can still come across Perry Mason films late at night in the upper reaches of my cable channels. The ever-present characters: Perry Mason, the intrepid and skilful defence lawyer, who always unmasks the real villain in a courtroom climax, to the relief of his unjustly accused client; Della Street, his loyal and efficient secretary; Paul Drake, the private detective who has an apparently inexhaustible number of employees able to drop everything to help Perry, with hardly ever a mention of a bill being presented; and Hamilton Burger, the hapless District Attorney who loses to Perry Mason almost every time. I came to feel sorry for Hamilton Burger. My own image of Perry Mason wasn’t the Raymond Burr of the TV series: my Mason was more, er, youthful, and slimmer. However, I read now that Raymond Burr actually auditioned for the part of Hamilton Burger, but when ESG saw him he said he was just how he imagined Mason. ESG wrote other characters as well as Perry Mason, including his ‘DA’ series, possibly as a change from the victorious defender Mason, or to show that he could sympathise with the prosecution too? His titles are great come-ons: to take some at random from the list, The Case of the Daring Divorcee, The Case of the Phantom Fortune, The Case of the Horrified Heirs, The Case of the Troubled Trustee. And we all love a courtroom drama, don’t we? ESG never claimed to be a great literary novelist. But he brought pleasure to millions. Thanks, Erle. I muse on this because of the mention of John Creasey in my last post (on very valuable commas). How fame can pass. When I was at school he was one of Britain’s most prolific and successful crime writers, under his own name and his several pseudonyms such as JJ Marric and Antony Morton. He sold over 80 million books. His dates? 1908-1973. I loved his work. His name is retained in the John Creasey New Blood Dagger Award, but apart from that he is largely overlooked. Perhaps his books are too rooted in their time: Inspector West and Commander Gideon are incorruptible, and don’t have damaged back stories. It wouldn’t be overly unlikely in his 1950s novels for a criminal to mutter “It’s a fair cop, guv”. 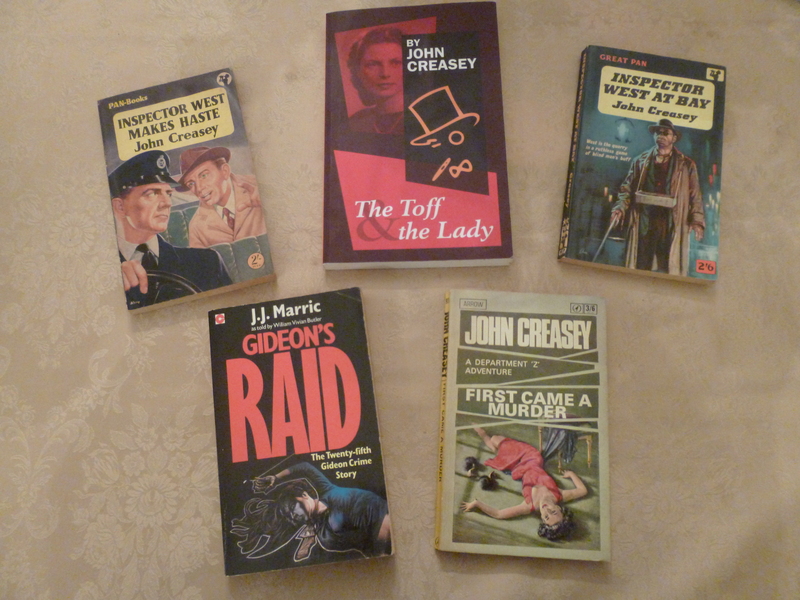 Tethered Camel Publishing recently reprinted some of John Creasey’s titles, but if you look on the shelves in Waterstones you won’t find him. What would be your choice? Lifetime success or posthumous fame?